This article is about the astronomical "horizon problem". For the problem relating to artificial intelligence, see Horizon effect. When we look at the CMB it comes from 46 billion comoving light years away. However, when the light was emitted the universe was much younger (300,000 years old). In that time light would have only reached as far as the smaller circles. The two points indicated on the diagram would not have been able to contact each other because their spheres of causality do not overlap. The horizon problem (also known as the homogeneity problem) is a cosmological fine-tuning problem within the Big Bang model of the universe. It arises due to the difficulty in explaining the observed homogeneity of causally disconnected regions of space in the absence of a mechanism that sets the same initial conditions everywhere. It was first pointed out by Wolfgang Rindler in 1956. The most commonly accepted solution is cosmic inflation. An explanation in terms of variable speed of light has also been proposed. When one looks out into the night sky, distances also correspond to time into the past. A galaxy measured at ten billion light years in distance appears to us as it was ten billion years ago, because the light has taken that long to travel to the observer. If one were to look at a galaxy ten billion light years away in one direction and another in the opposite direction, the total distance between them is twenty billion light years. This means that the light from the first has not yet reached the second, because the approximately 13.8 billion years that the universe has existed is not a long enough time to allow it to occur. In a more general sense, there are portions of the universe that are visible to us, but invisible to each other, outside each other's respective particle horizons. In accepted relativistic physical theories, no information can travel faster than the speed of light. In this context, "information" means "any sort of physical interaction". For instance, heat will naturally flow from a hotter area to a cooler one, and in physics terms, this is one example of information exchange. Given the example above, the two galaxies in question cannot have shared any sort of information; they are not in causal contact. In the absence of common initial conditions, one would expect, then, that their physical properties would be different, and more generally, that the universe as a whole would have varying properties in causally disconnected regions. Contrary to this expectation, the observations of the Cosmic Microwave Background (CMB) and galaxy surveys show that the observable universe is nearly-isotropic, which, through the Copernican Principle, also implies homogeneity. According to the Big Bang model, as the density of the expanding universe dropped, it eventually reached a temperature where photons fell out of thermal equilibrium with the matter; they decoupled from the electron-proton plasma and began free-streaming across the universe. They are now observed as the CMB. The decoupling is thought to have occurred about 300,000 years after the Big Bang. The volume of any possible information exchange at that time was 900,000 light years across, which corresponds to about one degree in the sky today. If the universe started with even slightly different temperatures in different places, the CMB should not be isotropic unless there is a mechanism that evens out the temperature by the time of decoupling. In reality, the CMB has the same temperature in the entire sky, 2.726 ± 0.001 K.
The theory of cosmic inflation has attempted to address the problem by positing a 10−32 second period of exponential expansion in the first second of the history of the universe due to a scalar field interaction. According to the inflationary model, the universe increased in size by a factor of more than 1022, from a small and causally connected region in near equilibrium. Inflation then expanded the universe rapidly, isolating nearby regions of spacetime by growing them beyond the limits of causal contact, effectively "locking in" the uniformity at large distances. 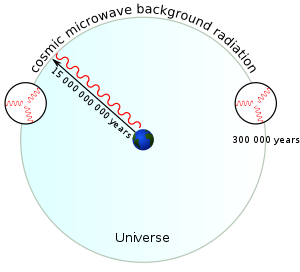 One consequence of cosmic inflation is that the anisotropies in the Big Bang due to quantum fluctuations are reduced but not entirely eliminated. Differences in the temperature of the cosmic background are smoothed by cosmic inflation, but they still exist. The theory predicts a spectrum for the anisotropies in the microwave background which is mostly consistent with observations from WMAP and COBE. A varying-speed-of-light (VSL) cosmological model has been proposed independently by Jean-Pierre Petit in 1988, John Moffat in 1992, and the two-man team of Andreas Albrecht and João Magueijo in 1998 to explain the horizon problem of cosmology and propose an alternative to cosmic inflation. In the VSL models, the fundamental constant c, denoting the speed of light in vacuum, is greater in the early universe than its present value, effectively increasing the particle horizon at the time of decoupling sufficiently to account for the observed isotropy of the CMB. In Petit's VSL model, the variation of the speed of light c accompanies the joint variations of all physical constants combined to space and time scale factors changes, so that all equations and measurements of these constants remain unchanged through the evolution of the universe. The Einstein field equations remain invariant through convenient joint variations of c and G in Einstein's constant. According to this model, the cosmological horizon grows like R, the space scale, which ensures the homogeneity of the primeval universe, which fits the observational data. Late-model restricts the variation of constants to the higher energy density of the early universe, at the very beginning of the radiation-dominated era where spacetime is identified to space-entropy with a metric conformally flat. ^ Carrigan, Richard A.; Trower, W. Peter (1983). Magnetic Monopoles. doi:10.1007/978-1-4615-7370-8. ISBN 978-1-4615-7372-2. ^ Remmen, Grant N.; Carroll, Sean M. (2014). "How many e-folds should we expect from high-scale inflation?". Physical Review D. 90 (6): 063517. arXiv:1405.5538. Bibcode:2014PhRvD..90f3517R. doi:10.1103/PhysRevD.90.063517. ISSN 1550-7998. ^ P. Midy; J.P. Petit (1989). "Scale invariant cosmology" (PDF). Int. J. Mod. Phys. D (8): 271–280. ^ J. Magueijo (2000). "Covariant and locally Lorentz-invariant varying speed of light theories". Phys. Rev. D62 (10): 103521. arXiv:gr-qc/0007036. Bibcode:2000PhRvD..62j3521M. doi:10.1103/PhysRevD.62.103521. ^ J.P. Petit; P. Midy; F. Landsheat (2001). "Twin matter against dark matter" (PDF). "Where is the matter?" (See sections 14 and 15 pp. 21–26). Int. Conf. on Astr. & Cosm. ^ J.P. Petit; G. d'Agostini (2007). "Bigravity: a bimetric model of the Universe with variable constants, including VSL (variable speed of light)". arXiv:0803.1362 [physics.gen-ph].